#SHALIEVE: Win It All For Ryan Shazier | "IT'S A STEELERS WORLD"! The back injury sustained by Pittsburgh Steelers middle linebacker Ryan Shazier has not only afftected the Steelers organization and the rest of the National Football League, but it has also had a deep affect on the Black & Gold’s loyal fanbase as well. An unbelievable amount of prayers and well wishes have flooded media outlets ever since Shazier was carted off the field in the first quarter of last Monday night’s game against the Cincinnati Bengals at Paul Brown Stadium. A game where his teammates rallied together for their injured brother to pull off a 23-20 comeback victory over the much hated division rivals. This Sunday night Pittsburgh will be taking on the other hated rival in their division as the face the Baltimore Ravens at Hines Field, which of course is shaping up to be another physical battle..as usual. But this game as well as the rest of the NFL season has a totally different feel and sense of urgency to it, because the Steelers are playing for Shazier as well as for themselves. #Shalieve and #PrayFor50 are hashtags that have donned posts on Facebook and Twitter as well as pictures on Instagram, and this December 10th on Sunday Night Football those words will also don all over the field. 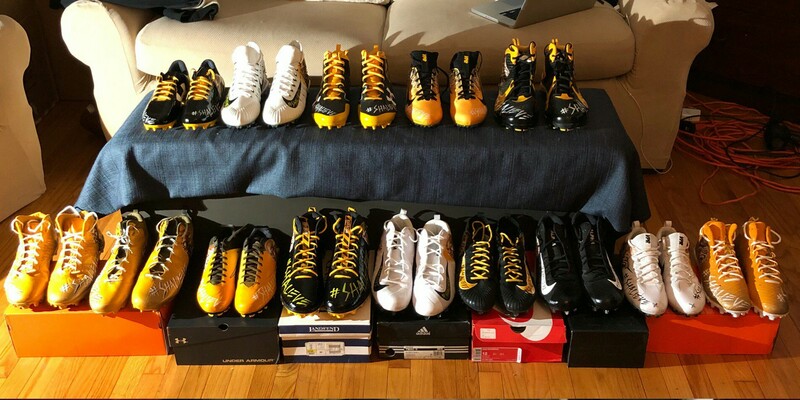 Up to 15 Steelers players got customized Shazier cleats for this Sunday’s game against the Ravens according to artist Corey Pane, who works closely with Pittsburgh All-Pro wide receiver, Antonio Brown. Let’s just hope the league will allow the team to wear these cleats, because we all know how the love to clamp down on individuality and self expression in the National Football League. 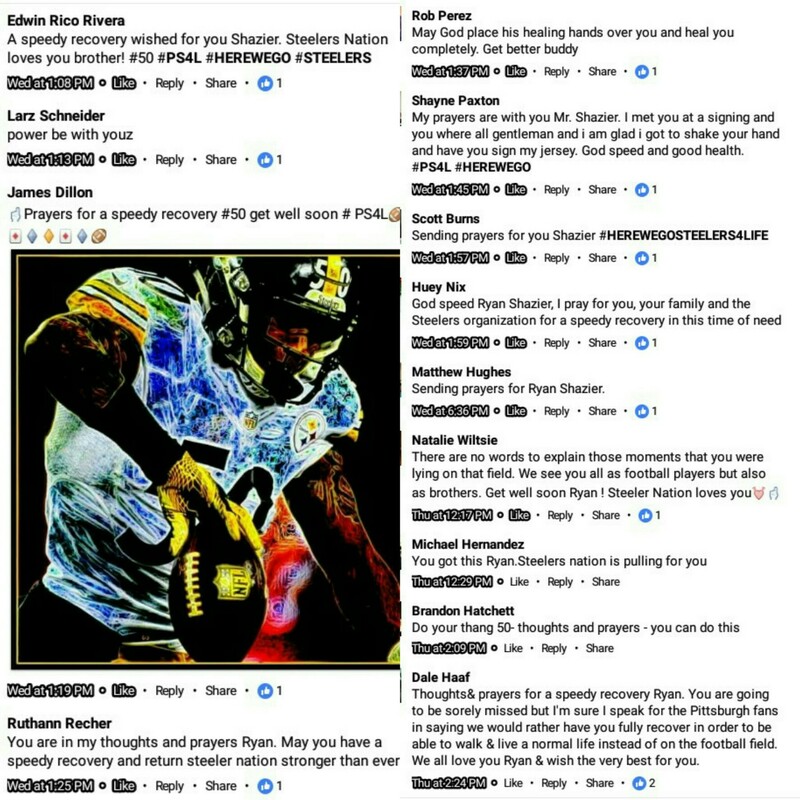 Along with the team’s prayers and dedication to Ryan, Steelers fans have expressed their sincerest thoughts and prayers on the situation as well on the It’s A Steelers World Facebook group page..
,.and believe me there were plenty more of the outpouring of love for Shazier. Way too much for me to add to this blog article. Below is a tweet sent out by Pastor Vernon Shazier, Ryan’s father. When life changes before you and fear grips you cling to the Lord who understands your every need, question and heart’s cry. I’m trusting God for a better tomorrow.